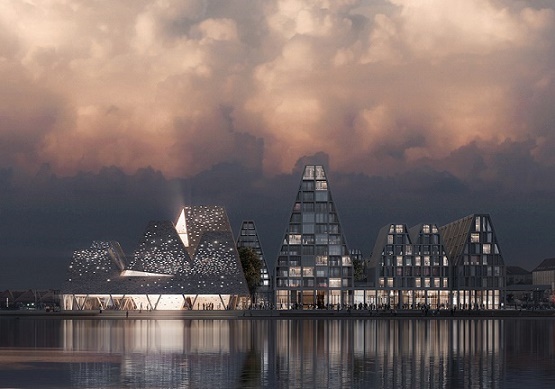 A 300 million kroner donation from Nordeafonden has cleared the way for the construction of a water culture centre on Copenhagen’s Paper Island, reports Politiken. As a result of an international architecture competition held last year, Kengo Kuma from Japan and Cornelius Vöge from Roskilde were awarded the contract to build the 5,000 square metre centre, which also includes both outdoor and indoor swimming pools and a harbour bathing area. However, final funding for the project remained uncertain. “With its spectacular architecture and its site by the harbour, the centre will become a new cultural meeting place that commends itself to all Copenhageners,” predicted Niko Grünfeld, the deputy mayor for culture and leisure. The new centre, which will be situated in the area that until recently was occupied by the popular Copenhagen Street Food market, is expected to be ready for use at the end of 2021. As well as the water centre, a number of blocks of flats up to 54 metres high are destined for the site. Parents of young children everywhere fear colic – and with some justification. It is a condition that causes otherwise-healthy children to have prolonged crying fits of more than thee hours a day. New figures from the University of Southern Denmark show that 12,000 small children end up having chiropractic treatment –many of them to alleviate this complaint. That is a more than doubling of the number over ten years, reports Politiken. As a consequence, a number of research institutes have decided to join forces to investigate the effects of this form of treatment. “We don’t really have any scientific basis for what effect chiropractic treatment has on the most affected children – those with baby colic,” said Dr Lise Vilstrup Holm from the university. TV viewing habits in Denmark are changing rapidly, if a new survey from Wilke presented at Copenhagen Future TV is to be believed. In just two years, the number of Danish homes without a TV program package has doubled, reports Politiken. At the same time, every third Dane is considering doing without a TV-package subscription. It is especially younger people who are driving the trend. Once they have left home, most don’t bother to subscribe to packages but would rather use streaming services such as Viaplay, where they can select the channels they prefer and avoid the rest. “People would rather put together their own entertainment package. Once you’ve got the taste for streaming and cut down on your TV-package, it is tempting to do away with cable altogether,” said Julie Nygaard from Wilke. The recently-deceased Roger Bannister may have made the English mile his own by being the first to run it in under four minutes, but it seems others are still keen to have a go. As part of the celebrations in connection with Crown Prince Frederik’s 50th birthday, the Royal Run will be held on Whit Monday (May 21) in which competitors run a ‘English mile’ in five cities around Denmark: Aalborg, Aarhus, Odense, Esbjerg and Copenhagen. Yesterday, the numbers who had signed up to take part in the Copenhagen mile had reached 7,472 – only 192 fewer than those who took part in the famous Fifth Avenue Mile in New York, the world’s largest. Copenhagen is also offering a bonus 10 km run to anyone with any puff left. You can still sign up on royalrun.dk and help make this the biggest one yet.